In Open Class competition every second counts. Minimizing muzzle lift so the shooter can transition between targets rapidly is essential to being competitive. BCA’s Open Class “Race” guns use a combination of compensators and barrel porting to tune your gun for your specific shooting discipline. Whether you building a steel gun or shooting the Bianchi Cup BCA uses the most advanced parts and machining processes to make your “Race Gun” the cutting edge leader on the field. BCA’s Competition Model is based on our Signature Series platform but has several modifications that make it legal for USPSA Single Stack Competition. We still incorporate EDM machined Match Grade Barrels but move to a bushing barrel system since bull barrels are not legal in the Single Stack division. This gun also includes a mag well for speed reloads and an ambidextrous safety to accommodate weak hand shooting requirements. The single stack model also includes our Low-Profile Bo-Mar adjustable sight to insure you can adjust your zero if you need to change loads. 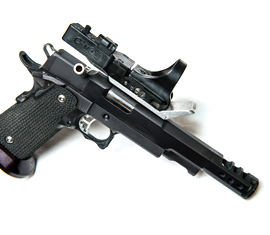 This pistol is available with or without a Tri-Topped slide to accommodate competition requirements. With BCA’s Single Stack Competition Model you’re on your way to the winner’s circle. Outside of Open Class competition, USPSA Limited and IPSC Standard division competitions produce some of the fastest shooting times in the handgun sports. This is a result of the repaid cycle rates achieved by the .40 caliber chambering and the allowance of high capacity magazines. 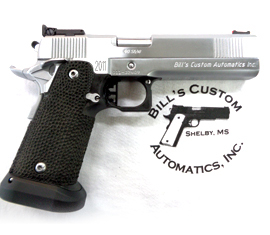 The Bill’s Custom Automatics’ Limited Class .40 Cal is built specifically to win these competitions. 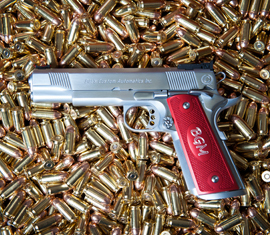 Our Limited .40s are built on STI High Capacity slides and frames. Limited .40s are available with the giant “Black Ice” polymer mag wells for USPSA competition, or the STI Slim line mag well’s required to meet the IPSIC Standard Division requirements. Because optical sights are not allowed in these divisions, the BCA Limited Class. 40 uses a fiber optic front sight and fully adjustable Bo-Mar style rear. When it comes to Limited and Standard class competitions, BCA’s Limited Class .40 Cal. in the appropriate configuration is the formula for WIN! Essentially a single stack race gun, BCA’s “Open Class” Steel Gun is designed to make quick work of USPSA steel competitions. This steel thoroughbred is kept light by building on a single stack slide and frame that undergoes the same extensive metal lightening procedures used to Mass Balance our race guns. A standard weight barrel and tapered cone compensator are also employed to keep weight to a minimum. The result is a light, well balanced, tool that delivers precision and performance measured in thousandths of a second. 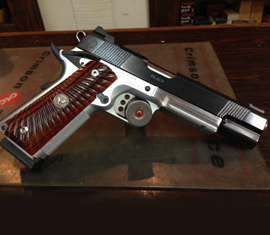 Bill’s Custom Automatics’ “Signature Series” 1911 is our most popular model because it’s designed to be your ultimate pistol. Benefiting from years of competition experience, this full size defensive pistol incorporates competition quality tolerances with real world usability. Inspired by competition, your Signature Series 1911 will literally have the same trigger system used by the current USPSA world champions. Modern fiber optic front sights help even older eyes stay on target. 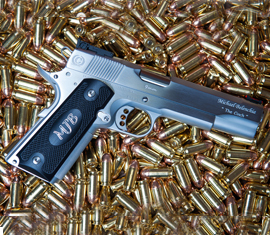 With the best quality match grade bull barrels available in the world, you will hit where you’re aiming every time Custom aluminum grips, with your initials engraved, provide a positive handhold that requires ZERO maintenance for a life time. 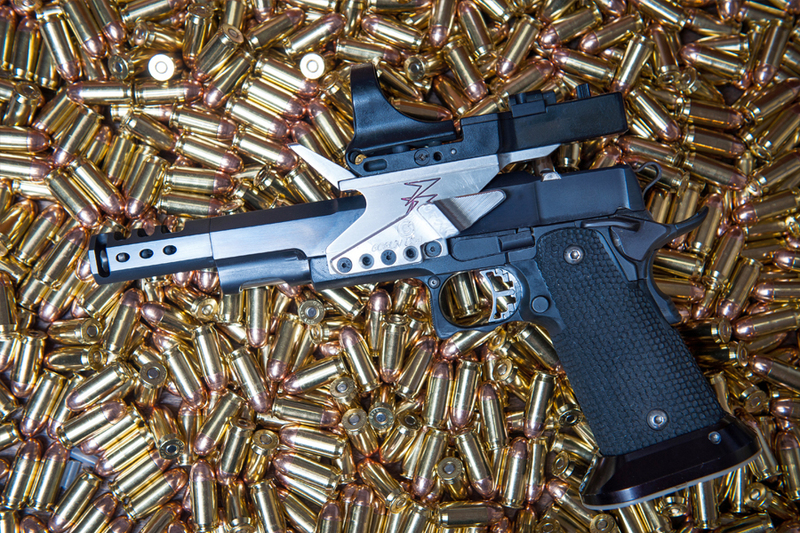 To build the ultimate Carry pistol, Bill’s Custom uses Titanium receivers. Our Titanium receivers drastically reduce the weight of the pistol making them much more comfortable to carry. Due to titanium’s unique inertial characteristics, these receivers also help reduce felt recoil. Bobtailing the receiver and combining it with a Tri-Topped slide produce the ultimate in light, shooter friendly carry guns. 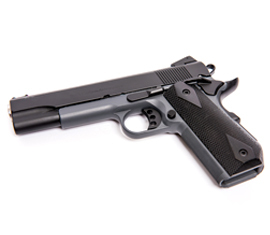 In the last five years there has been an increase in the 1911’s use in professional tactical operations from the Marine Core to Special Forces teams. One of the primary requirements for their missions is the ability to attach accessories such as strobing flashlights and lasers. The BCA operator is built to the same uncompromising standards as our Signature Series platforms, but includes an integral Piccatinny rail milled into the frame apron. This provides the flexibility to adapt the “Operator” to Piccatinny and Weaver compatible accessories to insure the success of your mission.